Below is the feedback from the students who attended SIGGRAPH 2014 in Vancouver, Canada through the Spend a Week at SIGGRAPH program. The ACM SIGGRAPH Computer Graphics Pioneers led and managed the program, which was supported by donations from SIGGRAPH attendees. GRAND NCE also supported the 2014 SAWAS program by providing a special lunch for the students and mentors. We’ve removed the student and mentor names, and reformatted the text for consistency. I was lucky enough to get a free full conference pass, which I am extremely grateful for. It is astonishing to see the wonderful work everyone has done and how they managed it. Over the past week, I have learned a lot, and am now a bit more certain on what I want to do later in life. Thank you for giving me and the other students an opportunity that some do not even have a chance to get. A few months before SIGGRAPH started, my IT teacher, Mr. Yung brought it up to the class, but he did not go into depth about the mentor program. Around May he brought up SIGGRAPH again, this time talking about a mentoring program that allows sponsored students to go for free. It seemed like a cool conference, so I asked my sisters what they knew about it and they explained more about it and encouraged me to apply. After I got accepted, I was really excited to go. I was expected that I would learn about programming and game design/development from SIGGRAPH. I had a feeling that the conference would be more art focused. I decided to research about my mentor. She had a really good demo reel about cloth and hair animation. When SIGGRAPH started, my mentor guided me on where to go and what I should see. She also gave me plenty of career advice such as to create a demo reel of my own and also gave some suggestions on my resume. She was really nice and I am very happy that she was my mentor. During the first day of SIGGRAPH, I learned my way around the convention centre, and attended a few of the talks. I especially enjoyed the Papers Fast Forward. The next day was my ticket for the electronic theater, it was an incredible show. I was taken aback by all the emerging technology. There was so much to see, and look forward to seeing in the future of technology. One of the best parts was the bird flying simulator. It actually felt like I was a bird and I wish I could stay in it a bit longer. After that I went through the days normally. The How to Train your Dragon 2 screening was great as well as the Dailies. The mentees had a trip to Bardel and it was so fascinating to see the work environment and workspace there. At Bardel everyone was working hard, it was really calm and relaxed there. What piqued my interest was how many people talked about rendering. I never knew that it would be such a big challenge for 3D modelers. One thing I noticed was how the presenters structed their presentations. They would never go too in depth about the programming side of projects. The focus would be on the final product or the art that went into the final product. I enjoyed attending the production sessions, mainly because you see the amount of hard work that goes into movies and games that we take for granted. The end of SIGGRAPH was not what I thought it would be, I thought there would be some sort of proper closing ceremony. That was not the case, since the conference just ended and everybody left. Aside from that, SIGGRAPH made me narrow down my scope of what career paths interest me. From my mentor to all the other people who were working very hard on their projects, it inspires me to try and explore the art side of technology. I also learned a lot about 3D modeling and motion capture technology. I would love to modeling in programs like maya, I find that it would be a useful tool to include in my skillset. SIGGRAPH was a great experience for all attendees. It would help out students that are not quite sure on what they want to do in life. I recommend for the future SIGGRAPH mentees to take a look at the many universities and colleges during the exhibition. It can help them make a better decision when applying to a post secondary school. I look forward to attending SIGGRAPH if it returns to Vancouver. I truly appreciate the sponsorship and opportunity to attend this fantastic event! My four days at the SIGGRAPH 2014 conference were extremely fun! I found about SIGGRAPH 2014 through the Digital Media Academy and was advised by my teachers to apply to the Mentoring program. SIGGRAPH 2014 seemed like a very interesting conference to attend and I was always curious about the post-production of films and games. And so, I knew that this was an amazing opportunity that would only benefit my understanding of the whirring ever-expanding industry in computer graphics. Before attending SIGGRAPH 2014, I knew I wanted to learn more about visual effects and animation however I wasn’t sure if anything that dealt in depth with technology would keep me engaged enough. With that being said I knew that in order for me to have the best time at the conference I had to leap over this mental block and keep an open mind. It was so exhilarating to walk through the convention centre wearing the green tag and knowing that everyone who was wearing one too was just as excited as I was to learn more about computer graphics. SIGGRAPH 2014 was a four-day learning hub for everyone who wanted to absorb new knowledge and soak themselves in their passion for computer graphics. My favourite part of SIGGRAPH 2014 was attending the production sessions or listening in on how a graphic artist created his movie posters. Moreover, I also thoroughly enjoyed learning about the production pipeline of “OWNED” a short film made by a few university students. I was completely amazed by their work; watching the young artists talk about their project was really encouraging, motivating, and inspiring. During my time at SIGGRAPH 2014, I was afraid that I was going to be negatively judged since I’m so new to computer graphics. I always braced myself for the conversations that would belittle me but to my surprise, I never found myself in a situation where I felt patronized. People attending SIGGRAPH 2014 were so friendly and genuine when I asked them about their line of work or the industry itself. The overall environment was warm, humble, and welcoming; this was very important to me since this aura is not always found in the “art community”. My mentor, along with her friend and fellow mentor, were extremely helpful with my inquiries. My mentor introduced me to Houdini a Side Effects software made for 3D animation and visual effects. Both my mentor and her friend provided me an idea of schooling routes and possible career paths. Overall, it was impelling to talk to such strong intelligent women who were working around in such a male-dominant field. SIGGRAPH 2014 has definitely impacted choices for my career path as it has expanded my horizons and knowledge on computer graphics especially visual effects. After attending this conference, I decided to look at what visual effects actually entailed and what kind of post-secondary institute would be a nice fit for me. The Dreamworks recruiters that came to talk to the students were very helpful when they described how such a big company works with various departments, artists, techs in production. My advice for future students attending the conference in the Pioneer Mentoring program would be to keep an open mind and to plan their schedule wisely. There were some sessions that I really wanted to see but unfortunately missed since it clashed with other seminars. It happens and there’s nothing we can do except to prioritize what we want to listen in on the most. In conclusion SIGGRAPH 2014 was a exciting conference that really taught me a lot about computer graphics. I had such a wonderful time meeting kind people and attending the various sessions and events. I’m really thankful to be able to be part of the mentoring program and I hope that one day I can go back to SIGGRAPH 2014 as a volunteer!! Kathleen Whelan, my Career Prep teacher, told people who signed up for this program about SIGGRAPH. Now I really wanted to be involved in video game industry since it is a well-­‐paid job and it’s a place of creativity and imagination. I wanted to be a level designer, who builds a map of environment and render to makes sure to give players a realistic experience. So I heard that this year, SIGGRAPH is happy to bring people from video game company to share how they render and capture a visual to make at least realistic and I ended up applying for this amazing opportunity. Before I arrive and get a glimpse of SIGGRAPH, I was expecting something like GDC (Game Developer Conference) or E3, but it was completely a different conference than any other usual conference. When I walked into Vancouver Convention Centre, I talked with my pioneer mentor. He works at Scalar, a place where people of IT engineers meet together and create computer environment and graphic rendering. He talks about his life career and teaches me by explaining all devices for my future career at a booth. I listened to a variety course that relates to video game rendering and how to create a character in video game as realistic as possible with every details. I learned that it takes a really amount of time for retargeting facial scan and editing eyes and mouth, and especially creating a female character is more time consuming just because they have to edit all the detail to match with look of her face. I saw variety gadgets from a exhibition hall and my favourite part of SIGGRAPH is trying out gadgets like Oculus Rift and Birdy. Now for future students who is planning to become a pioneer, I wish they can become a great role model by showing variety of cool products and motivate students for their future. This year was amazing and I really have to give a credit to my pioneer mentor who supported me and always text each other. I wish I can come back next year SIGGRAPH and learn more about rendering and trying out new system. Thanks for this opportunity. That was the first time I heard about SIGGRAPH, and I found the event interesting so I decided to apply. Before I arrived, I expected SIGGRAPH to be a big event and upon arrival, it was a much larger event than I imagined. My Pioneer Mentor was the Emerging Technologies producer for this years event. One thing that I learned from her is that it is very important to make connections with others and to expand your web of connections. In SIGGRAPH, I saw many exhibits and new inventions. What interested me at the exhibits, were the new 3D printers. I heard many talks and lessons about different ways animations were produced and the different ways they overcame obstacles. My favorite parts of SIGGRAPH were the exhibits and the production sessions. At the exhibit, I got to see and learn from the exhibitors how they created it and how they think it will influence society. At the production sessions, I got to see the different development processes, and the different layers added to it. What surprised me the most was the different things I learned from this experience. I expected to learn a lot, and I did. SIGGRAPH has widened my view of different opportunities for the future. On the first day, I had no clue what I wanted to do, but now looking back on my experiences, I think I may want to work on animation. I have started to look online on the programs and different processes of animation. Some advice I would give to future students attending SIGGRAPH is that time should be planned out well, as there will be a lot of events that you will not want to miss out. Also, do not hesitate to speak up and connect with the people around you. SIGGRAPH is an event that is definitely worth going to. I decided to apply right away knowing it would be a great experience. Before arriving at the convention center, I was expecting something smaller, and not as important to some really great, renown people and companies. During the week I attended I got to learn a lot from my mentor, who taught me about the many focuses of SIGGRAPH, as well as his personal past in different careers. With help from my mentor, I narrowed down my schedule on what to attend during the event, and was most intrigued by games focus. Once I knew my topic, I was at most of the conferences involving gaming, and my favorite of the course, the exhibition. The reasons it was my favorite of all the great things going on was I got to quickly go through a variety of peoples inventions and work projects and see so many different things so quickly. THe thing that most surprised me was all the great demos the people were allowed to test, I got to try some great indie games with people looking for feedback, and some new works in progress looking for support. SIGGRAPH affected my ideal career path by letting me see everything and how I thought of them as a future. If I could give any advice to future students of the program it would be to plan ahead, to make sure you spend every possible minute and one of the great events. Thanks you for the great opportunity to attend. Lord Byng has a program called Career Prep that lets students explore different career paths. To finish this course, a student must complete a hundred volunteer or work hours in their chosen field. I chose the field of Fine Arts and Design. I found out about SIGGRAPH when my Career Prep teacher, Ms. Whelan, sent the information about the conference and the details about applying to everyone who might be interested. Specifically, I have an interest in Graphic Design, so I was very intrigued when I was sent the information about attending a conference devoted to Computer Graphics. I thought it would be a very good place to explore my interest and the field of Computer Graphics as a whole. I was very excited to be accepted into the program. Before attending SIGGRAPH, I didn’t realize how massive of an event it is. I knew it was the biggest Computer Graphics conference in the world, but I didn’t realize how many passionate people from all over the field, and the world, would be attending. Having also never been to the Vancouver Convention Centre I did not know how big the building itself was. When I was on the SIGGRAPH website I saw the map of booths for the Exhibition and Job Fair and thought that would be the majority of the conference as those areas alone filled such an enormous space. Little did I realize but the conference was so much bigger and took up two buildings. I had expected to see some artwork, look around the booths and hear some talks, but what I experienced at SIGGRAPH was so much more then what I had expected. On the first day, I met my pioneer mentor, who was running the Communications booth at SIGGRAPH. She lives in San Francisco and is working on Haptic Technology in cellular devices. Together we explored the Art Gallery and Emerging Technologies, and my mentor proved the perfect person to be with. From attending previous SIGGRAPHs, she knew everyone we saw and was sure to introduce me to them all. Through my mentor I met a lot of people who were not only very friendly, but also very interesting. I learned many new things just listening to people talk about what they had been working on. This really taught me the value of networking, not only to make connections, but also to further your own personal knowledge of what is happening in the world of Computer Graphics. Throughout the week, I could always find my mentor to discuss the plans for the day, to tell her all about the exciting stuff that I had been doing or to get suggestions on what to see next. Having a pioneer mentor was a huge advantage being a first time attendee to SIGGRAPH, because the conference can be overwhelming and your mentor is someone who can help you decide what to do and show you around. This year we also had student mentors who were volunteering at the conference. My mentor attended Emily Carr University of Art and Design in Vancouver and he now works at Nerds Corp Entertainment. We met the second day of the conference and he was able to give me a lot of information on Emily Carr University, where I am considering attending, and he went through the schedule every day of the conference with me recommending things to see. I am very fortunate to have had two such involved and informed mentors who took time out of their busy conferences to help me have the best possible experience at SIGGRAPH. In the five days of SIGGRAPH, I saw, heard, and experienced many intriguing and fascinating things. I attended several production seminars on how several popular animated movies were made. I saw the creation of the Lego World in The Lego Movie and learned that every set in the film can be created in real life using Lego. I also saw the creation of the Amazon Jungle in Rio 2 and the algorithms used to create the river and effects of wind on hair and clothing in Frozen. Two definite highlights of the week were attending the Job Fair and Exhibition. The Exhibition was packed with new things to see. From receiving several bags of free stuff to trying ZBrush for the first time, there was always something to do there. There were also many schools that had booths that offered courses in Graphic Design. This was a valuable resource because I was able to see the many opportunities for post-secondary education in North America and collect all of their recruiting information that will be of use when I begin to apply to Universities. The Job Fair was also a good place to see the variety of jobs available in the field of Computer Graphics and many of the booths were very encouraging of women to apply for jobs as many jobs in the industry are predominantly held by men. I also witnessed a very interesting debate panel on women in Computer Graphics that discussed what girl power means and how to make women more involved in the industry. I was also happy to see the Electronic Theatre and all the amazing animation of the last year and see the Art Gallery. All though I enjoyed all my time at SIGGRAPH, my three favourite parts were designing my own t-shirt, Birdly and finally getting my Renderman Teapot! In the Emerging Technologies portion of SIGGRAPH, they had a station where you could print your own t-shirt by drawing your design on a computer. I spent an hour and a half drawing a design I had created of a flower on Photoshop and was very happy to receive my own personal t-shirt. Birdly was a virtual reality simulator that made you feel as though you were a bird flying through San Francisco. You lay down in the simulator and held two handles that functioned as wings that you could flap and turn. You were then given headphones to wear, computer goggles and a fan was blown in your face to make you really feel as if you were flying. As it turns out I was not very good at flying and crashed into a building. Finally, I spent three days lining up to try and receive one of the limited edition Renderman Teapots from the Pixar booth. For the first two days, I was roughly twenty people away each time from receiving one, but on the third day I waited for an hour in line and was the two thousand and three hundredth person to receive a gold wind up teapot. I am very proud to be one of only three thousand people who attended the conference to receive one and I will always keep it as a memento of my time at SIGGRAPH. What surprised me the most about the SIGGRAPH conference was how few women attended compared to how many men. A couple of times I was the only female in the room of some of the small talks that I attended. I thought this was unfortunate, because clearly the women that I met or heard speak at the conference are very intelligent, influential women who are doing very well in the field of Computer Graphics. I hope that when I become a part of this field and attend SIGGRAPH in the future, there will be many more women attending as I’ve been told that the number of women in CG is increasing and schools and companies are always looking for female applicants. Before attending SIGGRAPH, I wanted to go into the field of Graphic Design. I am still very interested in that career option, but attending SIGGRAPH opened my eyes to an abundance of interesting career paths in Computer Graphics. Attending the conference, it became apparent how strong the field of animation has become and I found myself intrigued by all the animation seminars and surprised at how many jobs were available for animators in the Job Fair. This has sparked an interest in Animation for me and I want to explore animation programs such as Blender and Cinema4D which I can experiment with at home. I have met so many people and learned so much over the past week. I will use this new knowledge to network in my future and I will use all the information provided about the post-secondary schools to choose my future education. And I now have seen possible jobs in Computer Graphics that I had not considered before but now I realize that I have more options to choose from in this field. I would recommend to any student, who has the opportunity, to attend SIGGRAPH. It has been a very beneficial experience for me. For anyone attending it in the future I would recommend to review the schedule book beforehand and circle everything that they want to see because there is so much to do it can be overwhelming. I would also recommend that they collect as much information on future schools and jobs as possible and to get business cards from people in their field of interest. Finally, I would tell them to enjoy themselves and take everything in because there are so many people to meet and amazing things to see. I learned so much at SIGGRAPH, I consider the experience an investment in my future career. It was time very well spent and I am so appreciative to all those who made this possible for me. I had originally found out about the SIGGRAPH Mentorship program thanks to the Digital Media Academy teachers at Argyle Secondary. They are both very passionate individuals in this industry, and take it upon themselves to help students get involved too. Together, they had attended the conference back in 2011, the last year that it was in Vancouver. After looking at the posters in class, talking to them about the program, and hearing about their past experiences at SIGGRAPH, I decided that it would be in my best interest to attend. At first, however, I was very apprehensive in applying to this program. Not because I didn’t think that it would have things to offer me, but rather because I was only turning 16 (the required age) during the conference. Still, I told myself the worst that could happen is that I wouldn’t get in. Either way, it would have been a learning experience! Before arriving at SIGGRAPH, I started to think on what I might expect to see. The SIGGRAPH website gave me a pretty solid outline on seminars and courses, but I was still quite curious as to the kind of people that might attend. Perhaps people that work in the CG area for higher companies within the industry, or even pioneers in various digital media aspects. Being told that there was much to explore however, I did try to keep my expectations to a minimum in order to endure and have fun being surprised! Myself, along with the other Student Mentee’s were assigned a Pioneer Mentor. I had been assigned a mentor who was a Web Content Manager for SIGGRAPH, a writer at Geek Magazine, and an owner/manager of a website. We were a wonderful match, and I found myself learning a lot from her. In the beginning, she told me a lot about her past experiences in the industry and where she got her education. Little things like back when she was younger, jobs like what she does now didn’t even exist, so she thought that by this point in time, she would be doing something completely different. A lot of her words were quite inspirational, and made me want to continue forward in the path I’m seeking currently. At SIGGRAPH, there was much to see and do. Trying to do everything that I wanted was quite difficult – but with the help of a few knowledgable people and an introductory seminar, things ended up going smoothly. Obviously there were many other first-timers at the conference like myself, so there were a few presentations aimed just at us. On the first day, I attended both the Ready, Steady…SIGGRAPH! seminar, and the Fundamentals seminar. Both of these highlighted key points, and “Don’t miss!” areas of the conference, to help us set up our schedules. They also gave brief introductions to computer graphic (CG) vocabulary, so that throughout the week, we wouldn’t be as confused. Another seminar I got to attend was one about Backstage CG production on two feature films. One by Dreamworks (How to Train Your Dragon 2) on water production, and one by Disney (Frozen) on creating frost and ice over standard textures. This was extremely interesting, as I had never actually thought about how these things were created – and how computers can actually make these things look realistic. I also got to present in a panel alongside my DMA teachers for their panel, giving my point of view as a student in their program. One of my absolute favorite things that I attended was the Keynote presentation by Elliot Kotek (of NotImpossible labs). I learned a lot about many projects that this company was undertaking, including one called Project Daniel, where they were taking 3D printers (produced by MakerBot) to Africa. There, they would be printing 3D arms and movable objects to help war victims in the area, so that any missing limbs they attained could be created and made to help them regain the use. It was incredible to hear that this idea wasn’t even from a bunch of medical professionals – but rather, passionate individuals in the realm of computer graphics and 3D printing who wanted to make a difference in the world. I also loved attending the Emerging Technology booths and seeing some of the “behind the scenes” modern technology. There was so many neat people and inventions there – from holograms that were projected, however you could feel them, to bird flight simulators using Oculus rifts…it was amazing. SIGGRAPH has really shown to me that there are many career paths within the digital media field. If something was to fail in my current-day plan, or if I lose interest in it, at least I know that there are other options out there to potentially pursue. It has also shown me that there is a wide range of people in the field, and that some of them and their jobs are more needed than others. With all that I have learned this past week, I plan to put to use in the classroom for the following school year. Being in the Digital Media Academy program at my school, a lot of what I learned at SIGGRAPH is extremely relevant, and will help me to influence my choices within those classes in school. I’ve also made a lot of connections this week, and have them all saved for in the future – because you never know when you’ll need a certain person! For future students interested in this program, I have to say that my biggest advice would be to not be shy! Try to open your mind, and talk to others around you. The neat thing about SIGGRAPH is that you never know who you’ll meet – it could be another student interested in computer graphics, or it could be an executive engineer at Disney! Chances are, they are more than interested in sparking up a discussion, and everyone has a story to tell. You’ll learn a lot from the environment of the conference, even though there is a lot to see. But, most importantly, don’t forget to have fun! If you asked me that before the conference, I would’ve said something around the lines of “A simple exhibition that included hands-­on programs to anyone who wanted to join the area of study.” I changed my mind on the very first day. I remember clearly walking out of the Waterfront Skytrain Station and heading towards the convention centre. When I reached the convention centre, I took a moment to take in the vast amounts of people, some were walking in groups, some were walking as duos, but they all looked like they had a purpose in being here, like this was only natural, that this was where they belonged. Looking at all of this before me, I have to say that I was dumbfounded. I exhaled and went into the convention centre to grab my full day conference. Fortunately, there were mentors there to guide us, so on the first day I met up with a friend and we went on to visit our mentors. I went to the fundamentals session but unfortunately I was too tired to really pay attention and mostly everything flew over my head. However, my mentor was nice enough to explain some things to me and ended up giving us a tour around his studio: Bardel Entertainment. During the times when my own mentor had to tend to his own businesses, I would go with my friend to talk with her mentor and try to gain some insight. Overall, the mentor program benefitted me quite a bit because I got to learn and socialize with them. Being the introvert I am, I would’ve just kept to myself the whole conference had it not been for the mentors. I visited the job fairs and exhibition, the job fairs didn’t really help me, but the exhibition section was probably the most informing and enjoyable section of the conference. I talked to almost all the people at the booths and visited all the post-­‐ secondary program booths. Unlike the production sessions and talks, I actually understood and was interested in many of these products that these booths held. I played many games that incorporated the oculus rift technology, and I had an amazing time. Some of the programs that the booths presented interested me and I had some conversations with them. All in all, SIGGRAPH2014 was a great experience and if I had to give future pioneering mentees some advice, it’d be something around the lines of: Talk to as many people as you can and try everything out. SIGGRAPH was really something that allowed me to step out of my high school life and see what the outside world was like. I had the privilege to attend SIGGRAPH 2014 as part of the Pioneer Mentoring program. I heard of SIGGRAPH from Ms. Whelan, my career preparation at school. I immediately decided to apply because, after taking the course of information technology in grade 10, I have always wanted to learn more about animation and video game programming. I expected to meet and learn from experts in this field at SIGGRAPH. During the week I am paired up with an amazing pioneer mentor. She is a Senior Production Consultant at Side Effects Software Inc. An expert in the industry, she helped me explore my career options and gave me an idea of what is it like to work in the field of computer graphics. Also, she led me through a tour of the emerging technologies exhibit to help me fully take advantage of the SIGGRAPH experience. My favourite part of SIGGRAPH is the emerging technologies exhibit. I was utterly amazed when I discovered that I can design a T-­‐shirt, or a phone case, and print it right on the spot. I also loved the production sessions, where I learned how the movies I love, such as How to Train Your Dragon 2, are made. The wonderful experience I had at SIGGRAPH really made me consider animation as a possible career path. As for now, I will share what I learned with my friends and family. If you are attending SIGGRAPH as part of the Pioneer Mentoring program, I would suggest you to ask your mentor all the questions you have in mind, because he/she is very knowledgeable about the field and very glad to help you. Also, I would suggest you to fully explore the exhibition area, such as emerging technologies and the job fair, because you are going to discover amazing things! It that took place between August 10th and August 14th. SIGGRAPH was THE to-go conference for those interested in the fields of computer graphics and for people to meet other professionals and 20,000+ other attendees from all around the world. I first discovered about SIGGRAPH via an email from my Career Prep class teacher about a student scholarship program at computer graphics conference for local Vancouver students. Without trying to sound cheesy and all, but it felt like destiny, because “computer” and “graphics” were my biggest interests and to have both at a conference was THE dream. I remember thinking to myself “I’m definitely applying for this no matter what” when I was around the 4th or 5th line of the email. It was exciting as I’ve never been to a conference for designers, or even just a conference or convention. After receiving the email confirming that I’ve been selected to join other local students to go to SIGGRAPH and explore the conference, I began to research different parts and events held at SIGGRAPH and started planning my schedule. A few hours later, I found that my calendar was completely filled with panels, talks, and production sessions. I was excited. Not only do I get to go see panels of the latest and greatest technology, I get to see the production sessions of my favourite movies of the year. My pioneer mentor is a Boeing engineer and a very nice and kind fellow. Although we couldn’t meet up on the first day, we were able to meet up the following morning and have a discussion about our experiences. His stories and experiences in the industry gave me a better idea of the industry in general. We met up again the next day and talked about what we’ve seen, what we’ve learnt, and what we should see next. At first, I had no interest in some panels, but after hearing my mentor’s suggestions, I was glad I went as I learnt quite a lot and liked the talks. On the last day, my mentor and I decided to walk around the Emerging Technologies and the exhibition, sharing our favourites from the past few days. It was an honour to meet a professional and I want to thank him for being my mentor at SIGGRAPH. As there were a lot of panels, talks, production sessions, exhibitions, and emerging technology booths to see, I attempted to go to as many of them as I could without walking out the door and thinking: “what did I just go to?” Even though SIGGRAPH was a full week (or 5 days) conference, it was still A LOT to take in with the amount of panels, and talks available. One of my favourites of the conference were the emerging technologies section. Some of the new technologies demoed were things I never thought were possible. For example, cascading displays to create a high-res image from a lower resolution source, and shifting the light source to areas of an image required with a projector to create a more vivid picture and better quality video experience. There were also a lot of panels I’ve seen, including “The Glass Class” and an X-men movie production session. All of those panels taught me more about some of the digital media fields I wasn’t quite familiar with. Although I’ve enjoyed the whole entirety of SIGGRAPH, there are certain “sections” of the conference I like better over the rest. For example, I quite enjoyed the Job Fair. Although I’m still a high school student and yet to be job hunting, the Job Fair was interesting as I had a few conversations with many of the companies present and asked about the “criteria” they were looking for and what it feels like to be working in their respective companies. Other examples of my favourites are the Emerging Technology, Studios, and the whole Exhibition. These booths allowed me to walk around and learn new things throughout the whole week. From the latest hardware to the newest softwares for digital arts and design. The Electronic Theatre was also a can’t-miss event; indeed, all of the animated films/clips were all so brilliantly made, especially the new Disney short film “Feast,” which was funny and adorable and got the whole theatre to say “awww” at many parts of the film. What surprised me most about SIGGRAPH was the advancement of augmented reality and virtual reality (or AR/VR in short) technology. SIGGRAPH was my first time trying on a AR/VR device, and little did I know how much has been put into the development of such technology. I also realized how amazing this technology was and how much can be done with it. From the Google Cardboard to the Oculus Rift to the bird simulator, every AR/VR technology blew my mind, literally. Before attending SIGGRAPH, my goal for future me was to become a devsigner (developer/designer). But after attending SIGGRAPH, I’ve realized the potential of the fields of arts and design and am considering picking up graphic design (and UI/UX design) as my main focus rather than as a hobby (or part-time interest) as I am now. I’ve learnt quite a lot in the past week and I feel like my brain is still trying to take everything in even after it’s all over. I’ve also learnt to stop focusing too hard on one certain field, but to open up to many different ones, as you never know if one day you’ll be replaced by computers. For future students attending SIGGRAPH as part of the Pioneer Mentoring program, I’d suggest you not to plan too much or too far ahead. There’s simply way too many panels for you to see, so just pick a few that interests you the most. And a great tip from my mentor, David, is that don’t just go to the ones (panels) you like, but go to every other one whenever you have the time. You’re still in high school, you never knew if you’ll be interested in something else! You’re here to learn, so try and enjoy yourself and take it all in. And most of all, have fun! Whilst working on my short animated film my media arts teacher, Forman Howes, showed me the Pioneer program. I decided to apply to the Siggraph student program because, I hoped it would help expose me to the vast industry and innovative software. I wanted to take the opportunity to meet veteran animators, which would allow me to ask questions about the industry, and get genuine answers. I researched on what Siggraph had to offer and found out it showcased different panels and emerging technologies. With all of this in mind I had no excuse to not apply to this amazing event. I honestly didn’t know what to expect from Siggraph. I previously had no knowledge of the event, but from my experience it was one of the most amazing conferences to go to. I knew it was going to be vast and full of people who are all interested in the industry of computer graphics. My Pioneer Mentor was a professor of computer science and electrical engineering. I was quite surprised being partnered with him since I had no previous knowledge of programming , but I wish to learn as much as I can. We discussed the different showings and panels to attend, and that if I find something boring to just leave and check out something else since there are loads of things going on. I kept this in mind due to the long, but fun, eight hour days! Siggraph had many revolutionary new emerging technologies, from people showing new gaming adaptations with the virtual reality, to feeling holographic objects. I participated in creating my own 3d model and met many talented artists and technicians. With art challenging technology, and the technology inspiring the art I was floored from amazement. I highly recommend heading to the art and emerging technologies exhibit each year to see new wonders. I enjoyed watching the panels of the behind the scenes of major films. I wish to pursue a supervision position and one day be in charge of creating phenomenal visual effects and animation. I enjoyed watching the behind the scenes of major blockbuster films like Guardians of the Galaxy and Gravity. I was keen to know how they manage their production pipeline and how they overcome certain obstacles they face. I was surprised how many people were kind and helpful with the barrage of questions I had. I remember having random conversations with people in line-ups; whether if they were an animator, an art director, or a NASA researcher. Everyone has a passion for their work and are willing to share what they know if you are keen to learn. I started out learning animation with a software called blender and to learn this software I watched many tutorials by a group called blender cookie. At Siggraph I randomly bumped into the founders of blender cookie and was shocked and surprised to see these amazing people who have helped me so much over the years to pursue my passion for animation. Siggraph has inspired me to continue networking with others later on in life and to keep on pursing my career to meet amazing people and create wonderful pieces of work. One panel in particular, the importance of a university degree in the industry, solidified my decision to go to university. I found that it not only benefits me as a person to take my time to learn what I want out of life, but to also take a mental note that I am only seventeen and that the industry isn’t going anywhere anytime soon. I learned that a degree is crucial to work internationally because many companies in other countries wont sponsor someone without one. Over the past week I learned that I am on the right track and I will continue to create short animated films. I will keep in mind the advice that was given to me over the five amazing days. My best advice that I can give to future students of the Pioneer mentorship program would be ask questions and to not be shy! I have met a few animators and other senior industry leaders that answered my questions with a kind smile. If you have any interest in entering this industry people skills is a must! The industry is a collaborative group of people who are kind and are willing to help students who wish to pursue their goals. I found out about SIGGRAPH through my Graphic Arts teacher at school, Darcy Smith. He actually recommended me and told me I would not regret going. With the teacher’s strike going on in BC and Vancouver, my schedule for the summer was blotched as I was intending to be at summer school for Socials 11 completion. SIGGRAPH was always on my mind as I was recommended to go so I made the decision to attend. I did not know what to expect from SIGGRAPH but my first impression was that it was like a more mature comic-­‐con convention. As SIGGRAPH doubles as a conference and a convention, it was far from what I expected. The environment is very professional yet fun and I’ve shook hands with at least 40 professionals and/or post-­‐graduate students from around the world. My Pioneer Mentor is a designer who has worked in many different industries including gaming. At the Vancouver SIGGRAPH 2014, he was a Director-­‐In-­‐Large and every 5 minutes, he would be stopped by a friend or a previous co-­‐worker. Evan is definitely a mentor with connections that he happily introduced me to. Evan gave me vital advice if I wanted to go down the career path of an Industrial Designer. I have seen a lot of emerging technologies, the making of films and games and, high quality films from a group of friends to a big company like Disney. The experience was great and I enjoyed it throughout. Food wasn’t a problem as it was provided one way or another and the stuff we received was pretty awesome. My favourite parts of SIGGRAPH 2014 have to be the Electronic Theatre, Emerging Technologies, The Makings of and the Exhibition Hall. What surprised me the most was actually the Electronic Theatre. I did not expect to see films and videos of this caliber. Emerging Technologies showcased what was coming. I grabbed many research papers and have seen the future of Virtual Reality as well as how vibrations and ultrasound could change how people live. The Exhibition Hall represented what companies have to offer in the present. It was interesting to see a mix of minor and major companies being exhibited. 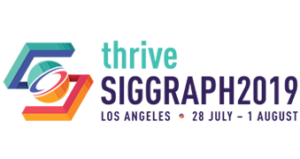 Future students attending SIGGRAPH as part of the Pioneer Mentoring program should not miss out on the Electronic Theatre or the reception. The Electronic Theatre is an amazing experience and completely unforgettable. The reception is a great way to network. Although we mentees are quite young, the opportunity for networking is out there as long as you take it. Who had summoned a few students he thought would benefit most and briefly explained how fantastic this convention would be for us. I was interested because for the past few years I have been considering a career in the film industry, animation being my primary focus. However in all honesty I wasn’t quite sure what I was truly getting myself into. I realised that attending SIGGRAPH would be an amazing opportunity for me to clarify my thoughts and learn as much as I can, so I applied, knowing that if I got this experience, I could only gain from it. I then had to be partnered with a Pioneer Mentor, I was paired with a man who works as a computer programmer for Adobe. He also has experience with animation, but not the sort of thing that one usually thinks of when they hear about animation. My mentor presented his technical paper at SIGGRAPH, his work focuses on the mathematical and programming processes for computer graphics. These processes can help animators create certain animations automatically and with more realistic movements. Not only did he reveal an entirely new facet of animation to me, but also helped me realise that I shouldn’t be put off by math or physics simply because the school curriculum doesn’t show the applications within my interest. Even though I am more focused on the artistic aspect of animation, I learned that having an understanding of some math, physics and programming would be a great advantage for me later on in my career. There will always be challenges during projects to overcome, so I shouldn’t shy away from learning things when I don’t think they will apply to me. One of the things at SIGGRAPH I enjoyed the most were the Production Sessions, where the creative processes and never before seen work behind many movies and videogames were shown. I got to see some of the creative minds behind the Lego Movie, How to Train Your Dragon 2 and Guardians of the Galaxy just to name a few. I was surprised by the amount of work that gets put into things one hardly even notices when watching a movie because of how well it was incorporated, and I was impressed with how much the visual effects aided the story without taking it over. Now when I watch movies I think of the blood, sweat, and tears it took to create some of the scenes. From what I’ve seen at these sessions I also got a clearer understanding of the work that animators do and I narrowed down my interest to character animation specifically. The haze of ideas I had about related careers had begun to clear up and I am more confident in my decision. There was much more however at the convention to enjoy, such as emerging technologies, where I not only saw a hologram, which impressed me greatly already, but I also experienced haptic holography, which means one can actually interact with the hologram. Using ultra sound waves the hologram reacts to the touch of one’s hand and can simulate textures. There was a glowing blue plasma ball hologram which was loads of fun and made me feel like a sorcerer. This was something I never thought I would be able to do anytime soon. I got to experience augmented and virtual reality, as well as trying new tablets and programs that are used by artists in the industry. At the job fair I discovered new schools I may want to go to for my post secondary education, as well as a better grasp at what different companies are looking for. This is an opportunity that I was very lucky to experience, so some advice I would give to fellow students who are to attend SIGGRAPH in the future is don’t be shy, think of as many questions as you can and don’t be afraid to ask them. Everyone there is passionate about what they do and love to share their ideas with others, so make the most of it, strike up conversations and make connections. One of the most important elements of the conference is that people with similar interests from all around the world come together to share their ideas, their progress, and to inspire each other. My IT teacher, Mr. Yung, introduced SIGGRAPH 2014 to my game development class in early May. I didn’t know what it was and what happened there then since Mr. Yung didn’t explain it in detail but I got an idea of what it was. I was excited to sign up and he told me that I will have to wait a few weeks until he receives more details on the sign ups. Out of curiosity, I looked up previous SIGGRAPH events and was really amazed by how informative it is about the astronomical growth of the technological world. I decided that I definitely need to attend it. Few days after the sign up details arrived, I signed up for it and not too long after I was accepted! As the days passed by and the conference starting date came closer, my hopes of moving forward toward my ultimate goal grew. I didn’t have any high expectations from SIGGRAPH since it was my first time. But I definitely wanted to learn as much as possible. My Pioneer Mentor’s was an Organizational Member at Web3D Consortium. I learned where I should be looking for and what I should try out if I want be a Game designer/programmer from him. I also learned what a person has to be able to do if they want to follow this profession. I saw various inventions that I had never seen before. For example there was this one machine in which you had to lay down and you got to fly as an eagle, I believe it was called bird flying simulator. Another example was this 3D interacting image in which you had to use actions to feed the cat with apples. I attended a lot of talks and visited exhibitions so I heard specific information on the topics they were about and I heard people screaming in excitement as their turn came. I experienced various interacting technologies; bird flying simulator, The Hapt-Optic Reconstruction and other technologies. My favorite parts of SIGGRAPH were: the technical paper fast forward, the keynote with Elliot and Computer Animation Festival: Electronic Theatre. I was surprised the most by The Moverio BT-200, it is a device in which you are able to view in augmented reality and it is on a whole new other level than the Moverio BT-100. I never knew anything this awesome was part of today’s world. Since I was 5 I’ve loved computer games, just like any other child would. I’ve always wanted to have a career in game creating. I’ve wondered for years with what specific job title I can include myself in the industry. But SIGGRAPH has made it clear that I belong more on the Designing/Art areas. I was told by people at SFU that they have SIAT which stands for School of Interactive Arts & Technology. I looked it up to find more details about it and thanks to SIGGRAPH I know exactly where I am going after high school to pursue my dream job. Over the past week I’ve moved a few steps closer to my ultimate goal. I’ve learned about Maya and other softwares with which I can advance my skill set. To those who are attending SIGGRAPH for the first time, I only have two tips to give: Don’t hesitate to ask questions from your mentor and organize your schedule for each day so you aren’t missing what matters the most to you. Thank you for giving this opportunity, it was an amazing event to attend. How has SIGGRAPH affected what you think you want to do as a career? “Over prepare and go with the flow” is the motto at the bottom of your email. I’ve adopted myself after realizing how uncertain and hectic the future is, thanks to SIGGRAPH. If you haven’t noticed, each passing generation is being asked answer the beckoning the call of growing up sooner than ever. I was proud I picked my career when I was young. I had way more time to plan ahead and brace for impact. Now, after leaving SIGGRAPH, plans have changed and I’m stuck with only 2 years to rethink and plan my life. I was dead-set on becoming a 3D modeler for EA Games, right after I studied at Capilano University. Suffice to say I’m really stubborn, which meant that I was going to be completely determined to get to my goal. Then SIGGRAPH happened. I found what it really took to become a modeler. You have to enter new challenges blindly. You have to be good a lot of things. You must be a bubbly team player. Sounds great, if you ask me. I’m bubbly, ambitious and a quick learner. Oops, I forgot to add the unfortunate factor of reality, most of the work available is outside Canada, it’s tough to climb up the ladder and I honestly have so much issues putting faith in others. I really needed to rethink my choices; maybe I really didn’t want to be a modeler for EA. Although I attended courses and talked to folks about modeling, I couldn’t help but really attend seminars with VFX (you shoulda’ seen me at the transformers ones). It spiked my interests, seeing as I’m taking it as a course in this following school year. I started asking around more, fortunately my Mentor had a great background in both animation and VFX, and then I found myself toggling between the animation/modeling and VFX. As Vancouver grows with the CG industry, animation still has a strong hold in the USA while VFX is starting to settle in lil’ old Vancouver. With VFX I don’t exactly need to leave Canada and I can do more work by myself. I soon became indecisive. The pros of VFX seemed to overlook the cons, unlike animation. Between these past 5 days I hoped I’d advance along my path of modeling, maybe animation too. As far as I’ve gotten with modeling and animation, taking up drawing and purchasing a computer with good ram… I cant help but sparking my studies in VFX. See, before SIGGRAPH I had a straight line, a perfect time line of my life. A little fairytale. No, I wouldn’t run off with my Prince Charming in the end, but I would be successful with a little bipity-bopity-boop and live happily ever after. After SIGGRAPH though, I’ve been forced to throw those plans away and start anew with intersections and bumpy-unpaved roads. Simply, I’m back at square one. So as the youth needs to over prepare and eventually have to go with the flow, I’m reentering the industry with new information and perspective of this crazy future. Armed and ready with new goals and am even more determined than ever. SIGGRAPH made me question what I really wanted. I’m more than grateful for the answers I’ve received and am not discouraged by my findings. I’m feeling more open and free with my career and future. I now have the ability to pursue new possibilities and have fun with it. Yes, SIGGRAPH deeply affected my path, if you must know. And with 2 years left before University, I need to ask myself “Where will you be in 5 years?” and now, with aid of SIGGRAPH I can happy say “I have no idea”. Thank you, I hope to see you again soon. I received an email from the my school counsellor just before the end of school regarding Siggraph 2014. The reason I applied was the email expressed each student would be paired up with a mentor and student volunteer of similar interest. I wasn’t really sure what to expected but I did assumed it meant there would be someone there to show me around or make suggestion of must see events. I’m not really sure about the mentors. Other than the first day of the conference and our luncheon I didn’t have any input from my mentor. I ran into my teacher Mr. Bulger and he advised me to see the behind the scenes of the Planets of the Apes, seeing how shots plays out in my mind based on the lighting, colour, and sound was surreal. A story starts off with a vision and a blank piece of paper, but to get that paper to leap of the page and stay for ever in our heart we need great things and that’s what Siggraph did for me. This experience brought the greatest minds and talents to the forefront. It makes us believe, it makes us want to better ourselves, it left me wondering how could it ever get better than this. Coming to such a large venue is intimidating at best, yet for me everyday was like Christmas, who would believe that 1000’s upon 1000’s of grown men and women would sit on the floor for hours just to be part of a Pixar Teapot phenomenon. Just walking around the exhibits with my pass alone was empowering, it was like being part of the Greatest show on Earth. Being surrounded by like minded people recharges your batteries you could walk for hours and still want more. Even though I seemed defiantly out numbered by men I felt as equal in their presents than at any other time in my life. People in the trade booths were genuinely happy to share thoughts, ideas, and information. I was surprised by the systems of networking that took place. I felt empowered to step out of my comfort zone and to stand tall. I found myself networking it was contagious and what I liked about it was having them not only listen to me, but hear me! I loved the freedom to explore and I loved the group meetings that allowed us the opportunity to not only meet up with others in the field like Neal from RockStar Games and the ladies from Dreamworks but to have the opportunity to have one on one talks with them. I guess what surprised me the most was how comfortable I felt talking to others. Siggraph gave me more confidence. Thank you for this amazing opportunity. Carpe diem, seized the day. I look forward to future Siggraphs. In my eleventh year in high school, I decided to take it upon myself to pursue learning in the areas that which I enjoy. By far, my graphics class had me produce the most satisfactory work than in any other class. By recommendation from my teacher, I discovered SIGGRAPH and immediately sent in my application. I believe it was a combination of wanting to fill my time with something substantial, and just innate curiosity that spurred me on to apply. Expectation included hands-on courses catered to beginners in the trade, and step by step instructions on how to construct a 3D model. However, when I walked through those doors, it what I saw was entirely different. Thousands of industry professionals milled about the convention centre, strolling purposely alongside colleagues donning tucked in dress shirts. Business cards were passed from hand to hand, handshakes were exchanged, and as I stood there in the midst of it all, I must admit; it was overwhelming. The scale of the conference wasn’t anything close to what I had imagined. But what I felt, aside from all the anxiety was, of course, excitement. Day one: meeting our mentors. At nine in the morning, I arrived at the convention centre half awake. The “Ready, Set… SIGGRAPH” session unfortunately proved to be not nearly as informative as I had hoped, so I set off to find information for myself. I attended the fundamentals seminar as suggested, and the mentors meeting was next up on the list. I had the pleasure of meeting my mentor, an extremely warmhearted person who gave me some insight into the industry. She told me a lot about SCAD (Savannah College of Art and Design) as she is the Visual Effects chair there. The exhibition was by far the most informative experience during my time at SIGGRAPH. This is due to the fact that I got to explore new software and acquire more information on potential future universities. In a lot of the talks and production sessions, while interesting, deemed confusing to me due to all the technical jargon that was not explained. I found that I was quite lost by the end of it, even after promptly looking up said unknown terms on the internet. This did spark some intrigue in me, however. I always knew that movie making was a long and complicated process, but seeing it all there before me was bewildering. Even if it’s just a small step, I’ve downloaded open source animation programs to start off. Learning all about the media arts industry has really opened my eyes to see the magnitude of how many opportunities there are, and that being an artist really doesn’t mean you must be a starving one. SIGGRAPH has given me more courage to pursue a more creativity based career, as that path is sometimes discouraged, deemed as impractical. With the knowledge and inspiration I have gained during that week at SIGGRAPH, I will be able to make a more informed decision regarding my future plans for post secondary education in the coming year. Advice for future pioneering mentees? Seize the day; why not give it a try? SIGGRAPH is a valuable experience that will give you a glimpse into the professional world, preparing you for the adventures that wait after high school. As I left the skytrain station and started the walk toward the water, I realized that the coming week would be like no other I’ve experienced. I arrived at the convention centre an hour early with my friend Andy (whom I have to thank for urging me to apply) and right away I felt the cool Vancouver breeze on my face as we took a stride near the harbour. I remember that a few weeks prior to the event, I was finding the application process to be cumbersome to say the least, mostly because of my own issues (being sick for a few days, in addition to the last wave of projects and exams; everything was a mess). Luckily, I ended up pulling myself together and applying, purely out of my passion for computer graphics. In any case, we followed the bulk of the attendees down the escalator to the registration area to get our conference passes for the week, only to realize that it was a mistake not to go down earlier. The line stretched across the hall and back.! ! ! To be honest, I really didn’t know what to expect from a worldwide computer graphics and design conference, mostly because of my inability to imagine how such a convention would go. I guess the only expectation that I had was that I would learn a lot of interesting approaches to implementing certain ideas. And surely enough, I was not disappointed. I learned a lot through the Tech Talks, I experienced cutting edge technology in the Emerging Technologies exhibitions, and I enjoyed discussing design issues with my mentor. Similar to myself, my mentor has done a fair amount of User Interface and User Experience design, but unlike me, he has had a lot of experience in the industry. He is working with the workflow and pipelines of designing solutions, as well as defining problems and user experience and interaction designs of given products. Through our discussions about app design and flow, I learned that it was important to be able to convey information to the user actively and accurately. Little details such as how an image animates, or how a transition is displayed is key in ensuring a consistent and pleasant experience. I also learned that it is crucial to learn a few basic rules in designing great user interfaces, and thus will be an area for further study.! ! ! I saw a great deal of things at SIGGRAPH that inspired me and allowed me to experience a whole new level of technology. I enjoyed going to the tech talks, because of the amount of technical information that they contained – I’m a technical kind of person. I saw a lot of AR and VR equipment at SIGGRAPH, leading me to believe that virtual reality really is the future. I had the chance to try out the Bird Simulator in the Emerging Technologies section, and that truly opened my eyes (literally) to what could be done with an Oculus Rift. And this is just the beginning. I heard a lot of talks about shaders, polygons, and technical aspects of computer animation, and found them very intriguing, due to how they work together to form the complete images. I learned a lot about how images were displayed on projectors, monitors, and about how those images are formed through software. As with any computer related work however, I realize how little I really know and how much I can still learn.! ! ! As with any major event, there is always a part that the attendees like the most. For me, that part involved both the classes and the emerging technologies. I always love to learn new approaches and new skills to help me tackle any design problems, and I especially liked the Glass Class course (which unfortunately extended past its scheduled end time thus resulting in me being late for the mentor meeting). I found that wearable design is significantly different from traditional interface design, in that the developers and designers are extremely limited in terms of usable space. Therefore, I learned ways that we can leverage what little space we do have to ensure usability. After all, wearable technology should be able to display glanceable information as it is needed. Other than the courses, I really enjoyed the hands on demonstrations and trials offered there, as I believe that people learn best not by bring told, but by being shown. I really liked a lot of the virtual reality gadget displays, because they gave me a chance to try some of the cutting edge technologies that I had been hearing about.! ! ! What surprised me the most about SIGGRAPH was the heavy emphasis on augmented and virtual reality sets. Being a leading computer graphics and design conference, I did not expect there to be a lot of AR/VR content around. That is in no way a complaint, however, as evidently, they are coined as part of the graphics family of products and services. I was surprised with how immersive and different the oculus rift felt from conventional methods of displaying graphics on screen. Nonetheless, one area for further improvement for these devices would be to bring a completely immersive experience, in lieu of having black space all around the two displays. A virtual reality can only truly be created when all of reality is blocked out.! ! ! I think that computer related work is going to be extremely prevalent in the future, and so therefore I believe that SIGGRAPH has played a huge part in helping me decide on future careers. I think a part of the reason is because of all the cool little things that everyone else is doing, whether it be an animation technique, a new display technology, or some other innovation. I find myself motivated and inspired by the works of others. SIGGRAPH has led me to see the true capacity of computers.! ! ! During the extent of my week at SIGGRAPH, I took several pages of notes from all the talks, sessions, and courses in order to have a basis for further studying. As much as I learned from the conference, there is still a lot more that I didn’t understand, and there is still a lot more that I have to learn. When I find the chance, I will go over my notes and search up any terms or techniques I didn’t understand.! ! ! I would suggest that all future SIGGRAPH Pioneer Mentoring program students bring a note taking device at all time, a light jacket (some of the rooms can quite cold! ), a water bottle, and some snacks. You can never really over-prepare for an event like this. SIGGRAPH has been an unforgettable experience for me; I learned so much about design, computer graphics, and technology that it reinforced my interests and passions for said fields. When you’re at a computer graphics and design conference with tens of thousands of other designers who are just as enthusiastic about what you do as you are, it creates a feeling of belonging. This feeling can be quite assuring and empowers you to create something even better.